As winter sleet, ice, snow, and ice loom, and the day-job continues its relentlessly demanding pace, I can at least celebrate the coming holidays. And the hols bring the Christmas romance and Hallmark Christmas movies in double-time! What does this have to do with Marnie Blue’s Mistletoe Kisses? Everything, as it’s a slip of a romance that sounds like category rom and smells like Hallmark. If you like one or t’other or both, you’re going to be a happy camper. I adore Michelle Smart’s category romances. The HP is my romance-ice-cream-tub of choice, so good while I’m reading it and then, disoriented and nauseous from melodramatic hangover. My forehead-slapping reaction: “Did I really just read that?” Yes, dear reader, I read them: the romance guilty pleasure, outlandish, overblown, eye-rollingly breaking every smidgen of feministic progress the genre has made. Some HPs are out there and so badly written, they’re easy to ridicule. Some are written with elegance and humour: I’m looking at YOU, Sarah Morgan. Smart’s HPs usually elicit the latter response, but A Bride At His Bidding? Well, this is one of the strangest HPs I’ve ever read … and that’s saying a whole hell of a lot if you’re one of the category’s aficionados as I am. I’m having a hard time making up my mind whether A Bride At His Bidding is a laughable mess, or brilliant. Maybe both? All I know is that its idiosyncratic narrative and character about-faces gave me reading whiplash, goggle-eyed reactions of gasping disbelief, derision, and heart-clenching delight and enjoyment. Cathy Pegau’s second Charlotte Brody historical murder mystery, Borrowing Death, is set between two colossal mistakes: the Great War and the enacting and enforcing of American Prohibition. While the Great War remains a definitive Canadian event, Prohibition figures prominently in the social rifts and conflicts of Pegau’s early-twentieth-century-Alaska-set novel. But Pegau’s journalist-amateur-sleuth heroine, Charlotte Brody, embodies an equally important historical moment. As Charlotte says, she’s not as interested in the 18th Amendment as she is in the 19th. Manda Collins’s (a new-to-Miss-B-romance-writer) Good Dukes Wear Black is third in her Lords of Anarchy series. Though Miss Bates hasn’t read the first two, she can safely say there’s nothing anarchic about Good Dukes Wear Black‘s hero, Piers Hamilton, Duke of Trent, from hereon referred to as Trent (Miss B., and thankfully, Collins, dislikes the name Piers). Au contraire, Trent is a sublime hero: generous, understanding, with just the right amount of protective bluster to endear him to reader and heroine. Our heroine is Miss Ophelia Dauntry, journalist on all things needlecraft at the Ladies Gazette. Collins ensures Trent and Ophelia’s acquaintance by making them friends to the heroes and heroines of the first two Lords of Anarchy novels. Though long acquainted, Trent and Ophelia are only aware of each other as attractive, available young people when circumstance bring them even closer. Ophelia’s fellow journalist, Maggie Grayson, is taken by two thugs (Maggie trying to fend off the brutes and getting a good boink to the head in the process) ostensibly on her husband’s orders because Maggie’s gone mad. Maggie’s husband, George Grayson, was one of Trent’s soldiers in the Napoleonic Wars. When George disappears and Ophelia discovers that Maggie may have be taken because of her investigative work into the mental institution’s unethical practices, Trent and Ophelia set out, as friends, to find Maggie and George and bring the culprits who took them to justice. Miss Bates read Phillippi Ryan for the first time, having noted time and again Phillippi Ryan’s name on the Agatha Awards nominee or winner lists. Phillippi Ryan’s murder-mystery-thriller-police-procedural narrative structure brings a wheel’s hub and spokes to mind. The novel opens, most dramatically, with a back-stabbing murder in the midst of a hot, tourist-laden June day in Boston’s Curley Park. This central incident radiates outwardly to a number of characters and situations, which come together in a masterful dénouement. The Curley Park murder scene draws hero and heroine, Jake Brogan, BPD detective, and Jane Ryland, unemployed journalist and Jake’s secret-lover. Jane freelances for a local TV station, working to resurrect her defunct career. A student-photographer claiming to have pics of the murder waylays Jane. Jake and DeLuca, his partner, run into an alley to discover a security expert wrestling the perp to the ground. Jane and her new photographer-friend follow. The scene is chaotic; neither Jane, representing the media, nor Jake and his partner, representing law enforcement, can tell the crime’s why or who. Meanwhile, in the mayor’s offices above Curley Park, teen-age Tenley Siskel, whose mom, Catherine, Mayor Holbrooke’s chief of staff, got her a job working the security video, may or may not have recorded the murder. Moreover, Jane responds to a call from her sister Melissa who’s frantic with worry over the disappearance of her nine-year-old step-daughter-to-be, Grace. In E. M. Hull’s horrific Sheikh, Ahmed kidnaps, rapes, and imprisons Lady Diana to avenge his mother’s abuse at his English father’s hands. Thank you, Wikipedia, Miss Bates didn’t have to read it to learn this. 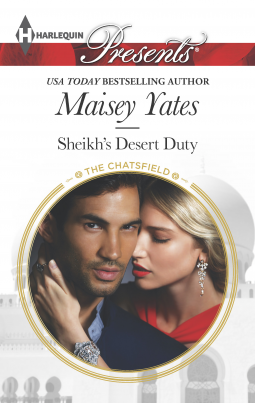 Maisey’s Yates’ Sheikh’s Desert Duty winks at Hull’s premise. Though the resemblance ends there, it is still a clever nod to one of the most controversial of the romance’s genre’s predecessors.